A shower which has been properly installed in accordance with the National Construction Code (NCC) and Australian Standards (AS 3740-2010) is very unlikely to leak expect in the case of extreme structural movement. However, leaking shower recesses are still one of the most common building faults and complaints today. In the majority of cases, poor or sub-standard workmanship is the reason why showers leak and need to be repaired. Unfortunately, our experience shows it is often the case that sub-contractors for home builders and even bathroom renovation companies take shortcuts when installing your shower. Perth Shower Repairs has seen many cases where water damage is caused by poor quality workmanship resulting in expensive shower repairs that could have otherwise been avoided. All construction work undertaken in Australia is required to meet the National Construction Code (NCC) performance provisions for the construction of buildings. This can be achieved through either complying with the NCC referenced standards, which in most cases is Australian Standard AS 3740-2010 – Waterproofing of domestic wet areas, or providing an alternative building solution that complies with the NCC performance provisions and is signed off by the relevant authority. Poor or sub-standard workmanship and failure to follow the construction code often go hand in hand. Local practices can take precedence over standard procedures resulting in sub-standard waterproofing and shower installation. In their industry bulletin (IB 061/2016), the Building Commission of WA identified that ‘non-compliant waterproofing requirements and incorrect grading of floors in wet areas’ continue to be commonly recurring building complaints. They also noted that ‘incorrect installation of the waterproof membrane in critical locations, such as around the floor waste, often leads to building damage from water ingress into adjacent building elements’. In our experience, one of the more common instances of non-compliance which can adversely affect shower waterproofing is the lack of or incorrect installation of a puddle flange under the floor grate. 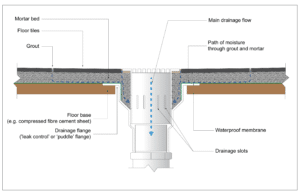 Puddle flanges are designed to allow any moisture that would otherwise by trapped between the tiles and waterproofing membrane to exit into the drain (see Figure 1). According to the Australian Standards, puddle flanges are required where there is a requirement for waterproofing such as on timber floors or homes built with a floor above ground. Installing a puddle flange is relatively easy, takes only minutes and is not expensive. However, a lot of puddle flanges are installed incorrectly or not at all resulting in unnecessary water issues down the track. Figure 1: Shower drainage control with puddle flange. Showers that are designed and installed correctly in accordance with Australian building codes should very rarely leak except in the case of extreme structural movement. All buildings are subject to minor structural movement in various forms such as subsidence, settlement, expansion and contraction of materials, bulging walls and bouncy floors. This movement is common place and occurs all the time, but it is usually of relatively small magnitude that it passes unnoticed. More extreme structural movement can result in the weakening or cracking of grout and the waterproof membrane, cracked tiles and corner joints in your shower. Water can then penetrate in behind the tiles, weakening tile adhesive and making its way into structural timbers and materials. Left unattended, these leaks can lead to costly structural damage and shower repairs down the track. 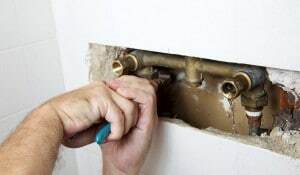 It is important to be on the lookout for signs of structural movement and, when necessary, call upon the professionals at Perth Shower Repairs to assess your leaking shower repair needs.